Dies R Us: A Winter Scene . 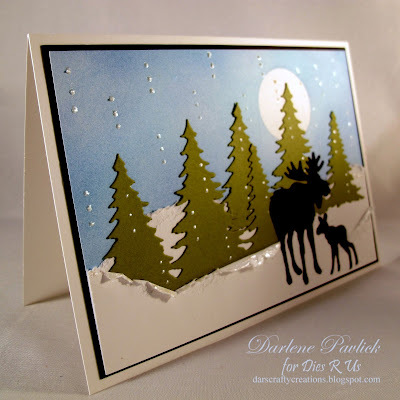 . .
Today I have a quick & easy winter scene created for your inspiration! 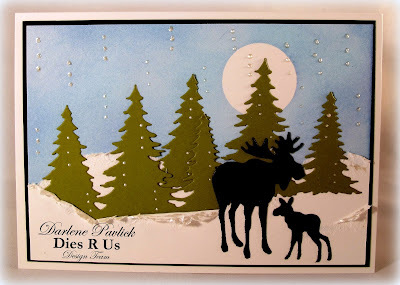 I'm always amazed at how quickly I put together a card with the use of these fabulous die cuts purchased at the Dies R Us Store. The possibilities are ENDLESS when using die cuts!! Using a white card stock panel, sponge your favorite shade of blue ink (I've used Tim Holtz 'broken china & faded jeans' distressed ink). ** I have circle punched a piece of masking medium (post it note will work too) and put it on my white card stock before sponging to create a moon. Tear a couple scraps of white card stock and adhere one in front of the other, leaving the upper portion unattached so you can insert your trees. Die cut 2 sets of the Memory Box 'Evergreen Trio' #99240 die set in your choice of green card stock shade ... I've used SU Old Olive. Position one set in between your snowy panels and the second set in the background. Die cut your favorite woodland critter and position in the foreground. I have used the Marianne LR0377 Mama Moose and Baby (sorry Marianne dies are not routinely carried at our store.) But there are several beautiful DEER dies available that would work perfectly in this scene! Just type DEER in the 'search' tab of our store to see what's available. Lastly add some 'snow'. I've used Liquid Pearls for my snow effect. I hope you've found inspiration in today's card creation and remember you can stop by this inspiration blog any week day (Mon-Fri) for a new inspiration sample from one of the design team members! There's a new challenge up at the Dies R Us Challenge Blog! The theme is a 'Photo Inspiration' using HOT COLORS ... be sure to come check it out and then join in the fun! YOU could be the next winner of a $10 gift voucher to the Dies R Us Store!! and I (Darlene) will see you once again on Tuesday!